“Pope,” or “Pope Emeritus” ? This is an inappropriate usage, and I think we Catholics need to clean it up a bit. Emeritus is the Latin past participle meaning, “having merited one’s discharge by service; having served one’s time. 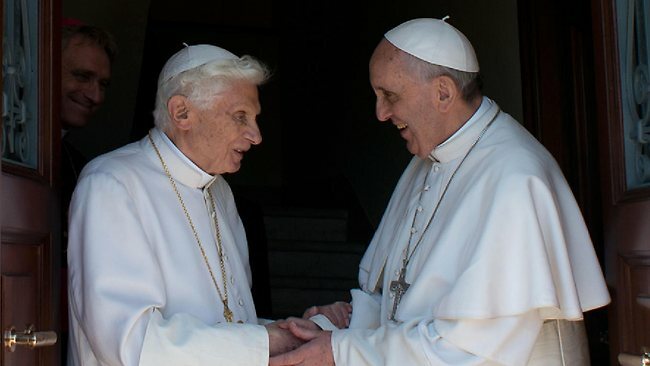 Having served his time until frailty overcame him, Benedict chose for himself the title, “Pope Emeritus,” as a way of being referred to during the pontificate of his successor; a wise move to clear away any confusion as to who is in charge and where the lines of authority lay. When he spoke at World Youth Day, or acted during his pontificate, he was not a “Pope Emeritus,” and it is wrong to refer to him as such. He was the pope, just as John Paul II was the pope. Therefore, it seems that we should refer to Benedict as “Pope Benedict” when we speak of his actions during his papacy, and as “Pope Emeritus,” when we refer to him or his actions during Francis’ papacy. Therefore, the title “Emeritus” is a transient one, meant only for the time period between his stepping down and his return to the Lord. “Pope” is not only proper to attach to him for events during his papacy, but altogether respectful, truthful, and historically accurate. You make a valid point. I have used “Pope Emeritus” as you describe it. I should probably make the changes on my own blog. Thanks for the heads up, Gerry!